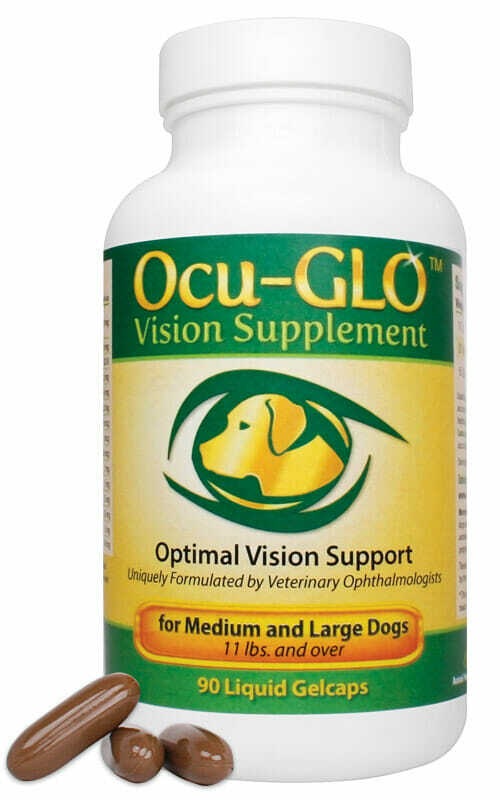 Ocu-GLO Canine Vision Supplement for Medium to Large Dogs is a blend of 12 different antioxidants that compliment traditional therapy, and are formulated to protect vital cells in the eye at the DNA and protein levels from oxidative damage. Purchasing this product today earns you 82 DR Reward Points! Ocu-GLO contains 12 natural pharmaceutical grade antioxidants that work together to support the nutritional needs of your dog’s eyes. The three cornerstone ingredients are lutein, grapeseed extract, and omega 3 fatty acids. Lutein is an oxycarotenoid found in dark leafy vegetables, colored fruits, flowers such as marigolds, and egg yolks. It is readily bioavailable and is very important for retinal and lens health. Grapeseed extract is a potent proanthocyanidin antioxidant. Omega 3 fatty acids enrich the normal function of retinal photoreceptors. These cornerstone ingredients are combined in Ocu-GLO with nine other carefully chosen antioxidants in the optimal concentrations and work synergistically to support canine eye health. It is critical for supplements to provide the correct amounts of the right ingredients for our dogs’ ocular health. For example, popular over-the-counter human vision supplements do not contain adequate lutein for the health needs of the canine eye. Other Ingredients: Gelatin, glycerin, purified water, soy lecithin (non-GMO), beeswax (yellow), carob extract, soybean oil (non-GMO) & titanium dioxide. Ocu-GLO is a trademark of Animal HealthQuest Solutions and the formula is patented. How long will one bottle of Ocu-GLO™ last? This depends on the weight of the dog.